March Lawson didn’t plan on becoming a sheep herder, but when her parents died of influenza, that’s exactly what happened. She also didn’t plan on becoming an embezzler, but when her family’s solicitor failed to take care of her as well as her brother and sisters, she had no other choice. She would do anything to feed and protect her family regardless of legality. All she had to do was hang on until she could give her sisters a proper introduction into society and provide her brother with the education needed to handle the estate. Forging the Marquess of McCalpin’s signature wasn’t very difficult and it wasn’t as if she were stealing from him. She was actually stealing from herself, the trust that was supposed to be handed over to her once she turned twenty-five. She just needed to do it one more time to get the funds needed to provide for her siblings. Little did she know that McCalpin had discovered what she had been doing. McCalpin didn’t have a head for numbers so he constantly had to rely on his brother, William, to help him. It took him a while to realize what March had done, but when he met her face-to-face, he found he wasn’t as eager to condemn her for her acts. Instead, he found himself helping her and her siblings. Despite William’s protestations, McCalpin took it upon himself to care for the Lawson family. What he didn’t plan on, however, was March driving him to distraction. She wasn’t completely trustworthy and the last thing he needed was for her to discover he couldn’t calculate simple addition. 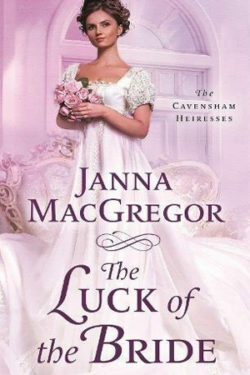 Janna Macgregor continues the Cavensham Heiresses series with THE LUCK OF THE BRIDE. Old characters have re-appeared onto the scene and new ones have been introduced. She intertwines these lives into a tale of a long legacy of passion. Although this story stands alone perfectly, read THE BAD LUCK BRIDE and THE BRIDE WHO GOT LUCKY in order to fully understand the back story.